Welcome back! If you are reading this, you are either here intentionally or the Google machine sent you here by mistake. Either way be sure to sit down and strap in because this is going to be an exhilarating experience! 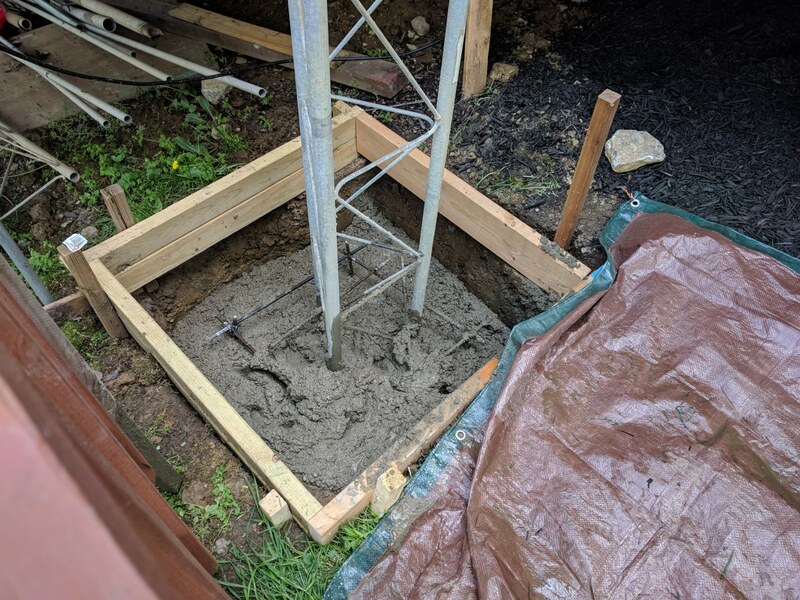 So my fancy book readings told me that due to the magical properties of concrete, you should build a box out of rebar and pour the concrete around it. Concrete has great strength in compression, but doesn’t have nearly as much strength when tension is applied. To remedy this, we add the magical properties of steel. 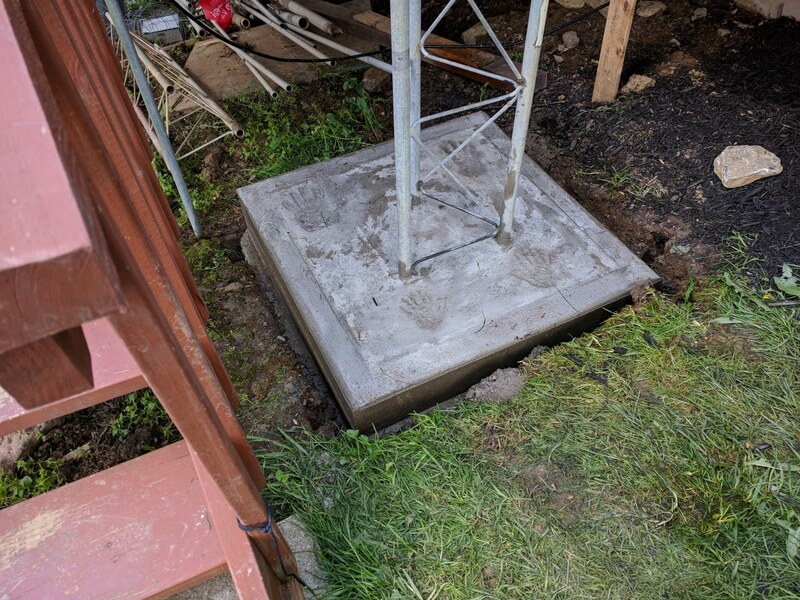 Steel is STRONG in tension, so by building a box out of the stuff and pouring concrete around it, the steel takes the tension and “the crete” takes the compression. 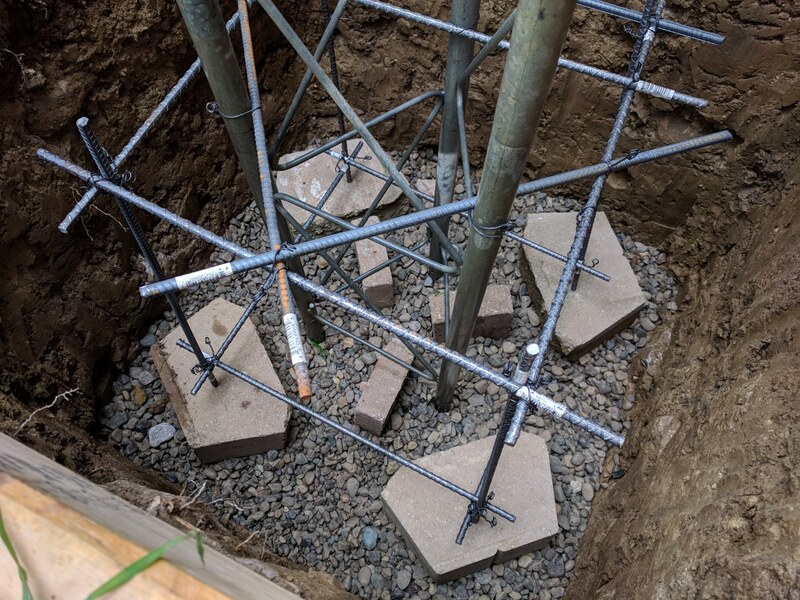 By putting some blocks/bricks/books/bills under the rebar cube, it will ensure that the box sits off the gravel base and no rebar ends extend out past the edges of your concrete cube. 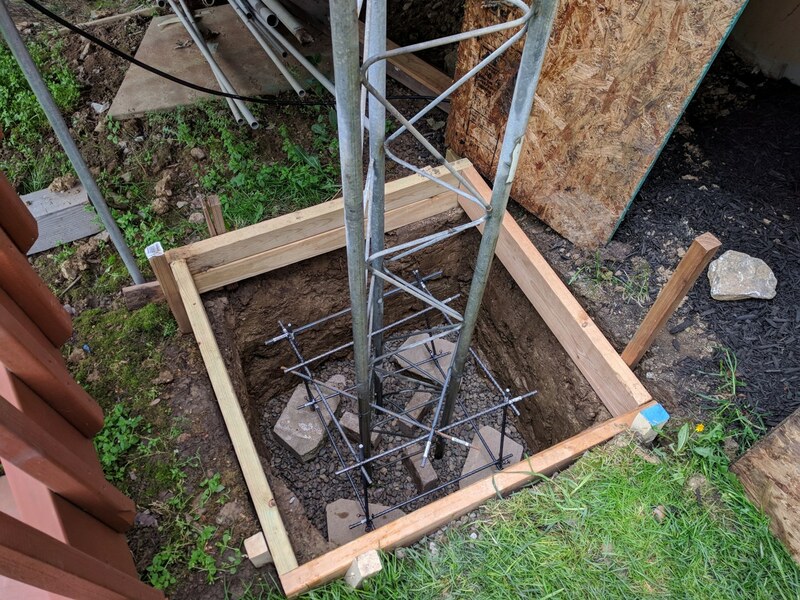 This is important so that moisture doesn’t rot away the rebar over the years, thus compromising your tower cube and possibly the tower’s structural integrity itself. 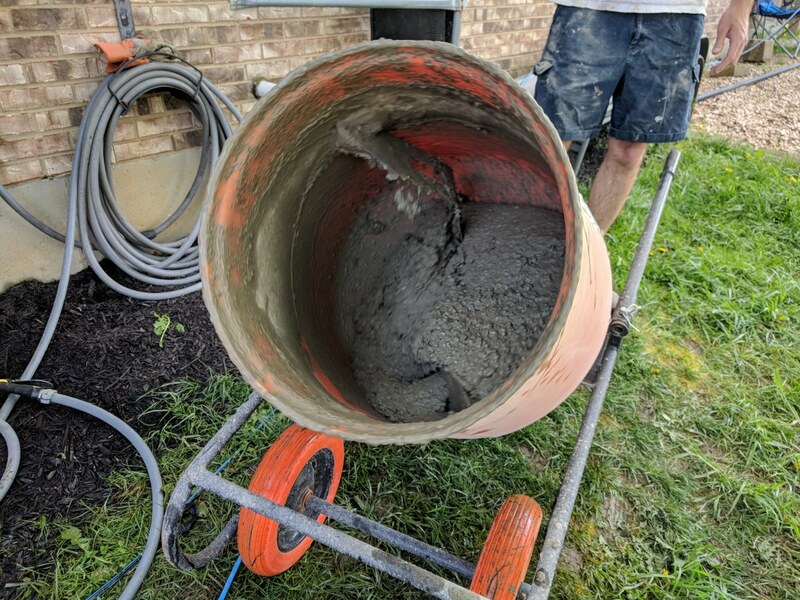 Now if you weren’t already awe-stricken by my hole digging capabilities you will surely be amazed by my cement mixing skills. Now, you may think to yourself “Self, I am a strapping young man and can do all that mixing with my trusty hoe and wheelbarrow without spending the $36.00 dollars required to rent a mixer for 4 hours”. To that I say you are crazier than a dog in a hubcap factory. That fancy orange mixer handled two bags of “the crete” and would have it mixed to a perfect tower cube makin consistency in under 3 minutes flat. Then you just wheel it over to the hole, turn on the rotatification mechanism, and dump her in like you would a wheelbarrow. Only a crazy person would do 50 some odd bags by hand.. 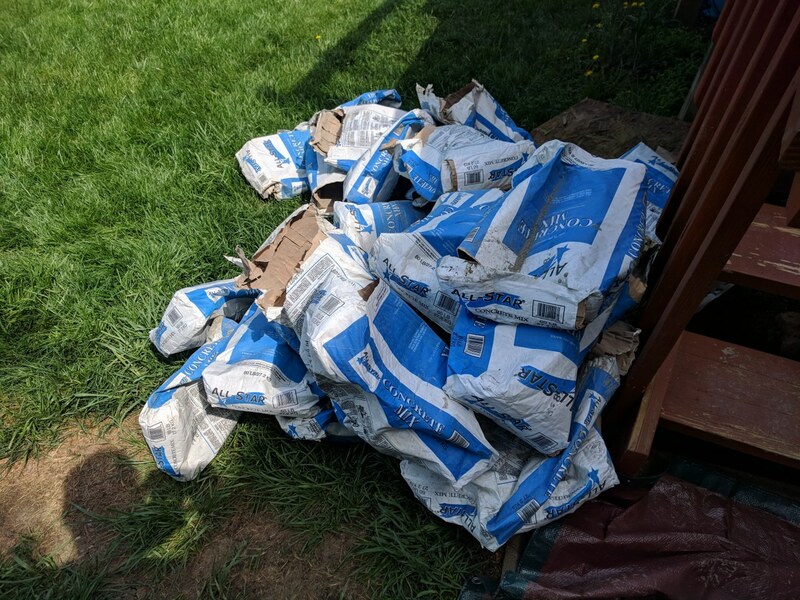 I layed a tarp on the ground in front of the hole in hopes that it would catch any stray cement that tried to escape its cubical demise. This worked great since I dumped 1/4 of my first load on the way to the hole. There is a little bit of a learning curve to using the mixer. Lets all just take a minute to remind ourselves that we are, in fact, amateurs of the mysterious radio arts. With the hole filled to about level with the wooden frame, I did many magical concrete finishing techniques to make the top of my cube look more appealing to the XYL. And lets just face it, making the tower project appealing to our XYL is really the most important part of this project. 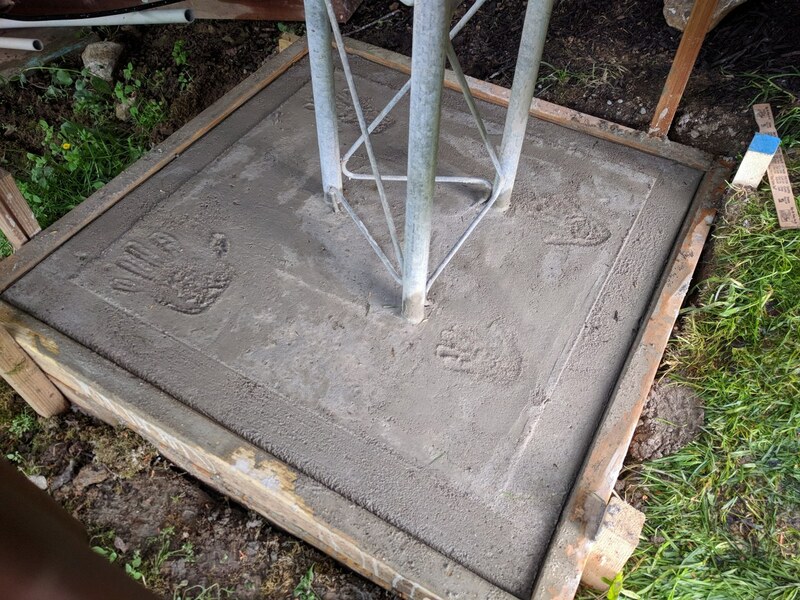 Be sure to scribble your call sign, name, or hand prints into the wet concrete so that others in the future can have the privilege of marveling at your accomplishment. Or they can at least curse you as they try to dig it out in preparation for building that new deck where you planted your tower many moons ago. After 24hrs it should be safe to remove the frame around the top of your cube. Since the concrete is still considered “green” at this stage, you will want to be careful not to chip the corners off of your finely crafted eyesore. It will take roughly 28 days for “the crete” to cure to about 95% of its maximum hardness. Be sure to water it a few times a day so that the top of the cube stays moist, which will aid in the curing process and prevent the top from cracking. This crucial watering is also required so that your tower will begin growing, as you will see in part 3. 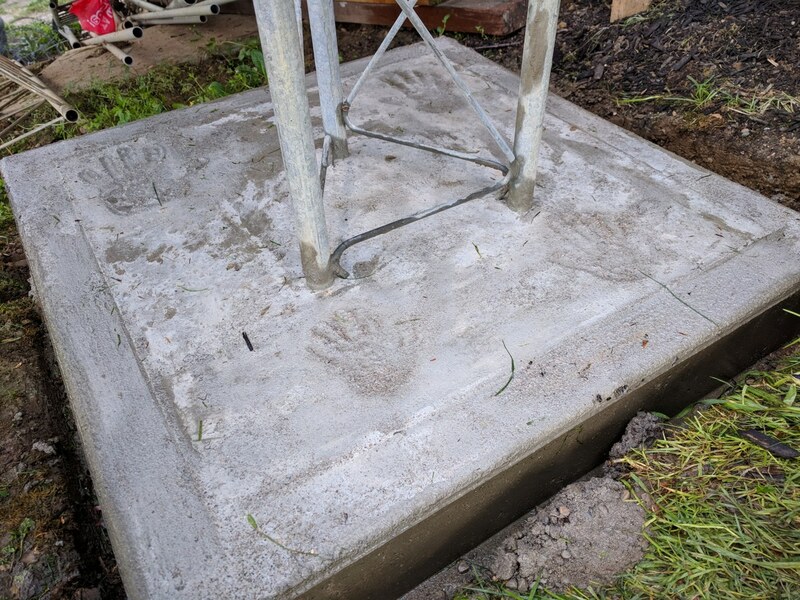 In the final step of pouring your tower base, you must step back and marvel at the fine job you did. 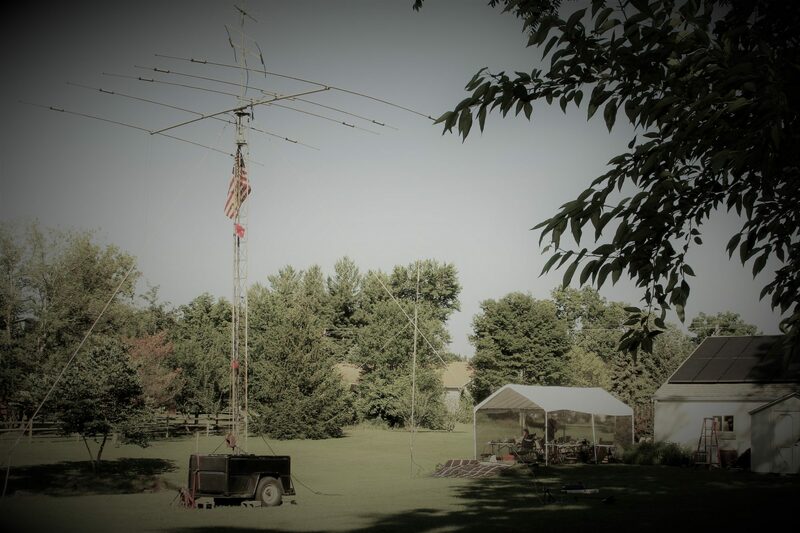 Pat yourself on the back and remind yourself that you ARE a very handy individual, and even though you didn’t get the grass mowed this week there is something much bigger growing in your lawn. Thanks for reading, and stay tuned for part 3 which revolves around making it taller than 7′ above the ground! Moving Pictures?! Blasphemy! It’l never catch on..